CAUTION: Do not use warm water or cleaning solvents to remove Toner from your skin or clothing. This will set the Toner and make it difficult to remove. If any Toner gets on your skin or clothing, use a brush to remove the Toner, or wash it off with cold water and mild soap. NOTE: A message will be displayed on the Control Panel when the Toner Cartridge needs to be replaced. Make sure the machine has stopped copying / printing. 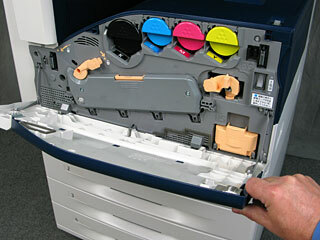 Open the Front Cover of the printer and locate the Toner Cartridges. As a precaution, place a few sheets of paper on the floor, under the Toner Cartridge area, to catch any Toner that may spill. 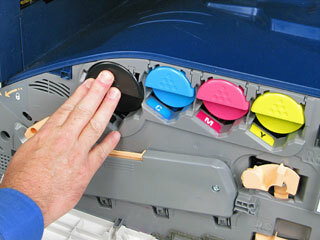 Grasp under the lip of the Toner Cartridge and then pull the cartridge straight out of the printer. Remove the new Toner Cartridge from the packaging. Tilt the cartridge up and down, then left and right 10 times to loosen the Toner. Hold the new cartridge with the arrow facing up, then push the cartridge into the printer slowly until it stops. 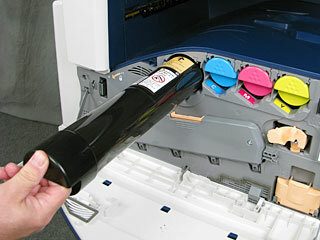 Push gently on the Toner Cartridge to ensure that it is seated properly. Repeat steps 4 – 7 if another cartridge needs to be replaced.